The narrative in the Torah describes how the dreams of Pharaoh came to pass. There were seven years of great abundance, and then there was seven years of great famine. It was a few years into the famine that Jacob sent his sons to Egypt to buy grain because of the severity of the famine and their need to eat and live, not just their families but also their livestock. We are told in the Torah, Joseph’s brothers went to Egypt, and that Joseph was the man to whom all peoples came to buy grain. So Joseph’s brothers were destined to come face to face with him and realize the evil they had done to their brother. When the brothers arrive, Rashi says on Bereshit / Genesis 42:7 Part 2 “ויתנכר אליהם HE MADE HIMSELF STRANGE UNTO THEM — He made himself like a נכרי a stranger to them in his conversation, speaking harshly (Genesis Rabbah 91:7).” Rashi says that he spoke harshly with them and this caused him to disguise himself from them. Is it possible that Joseph did not change his features in order to deceive his brothers but merely spoke to them in a tone and language which made it unlikely that they would associate who he really was with being remotely similar to their brother? Only after his brothers had told him where they came from did he recognize them? It could be that Joseph became convinced they were indeed his brothers only after having talked to them. The rabbis say that this accounts for the Torah writing once more: וַיַּכֵּר יוֹסֵף אֶת-אֶחָיו (verse 8). This point in the text of being their brother but yet being disguised to the nature of who he truly was is a very important observation. The reason being, this is related to being disguised and hidden as it is related to the Messiah and the Torah. In Joseph’s case, Radak on Bereshit / Genesis 42:7 Part 2 states “ויתנכר, Joseph moreover deliberately misrepresented himself to prevent their suspecting that it might be him.” We are presented with the idea that Joseph deliberately misrepresented himself so that He could find out what was going on in the hearts of his brothers. To sort out what their true intentions were and whether they had truly repented and changed from the time they had treated him so badly holding murder in their hearts. In the sense of Joseph being mashiach (messiah) who saved many people, this teaches us something about the presuppositions and philosophical beliefs we hold on to as it is related to HaMashiach (the Messiah) Yeshua. In the Apostolic Writings, we read Yeshua was born as a common boy in a smelly stable, wrapped in swaddling clothes and laid in a crude cattle trough. This may be understood as a hidden way, an unassuming way in which He made His debut in secrecy and mystery. This is consistent with what Yeshua said later on, “I am meek and lowly in heart” (Matthew 11:29). According to the Apostolic Writings, the Messiah was born in a borrowed stable, he taught in a borrowed boat, he rode into Jerusalem on a borrowed donkey, he ate the Passover Meal just before his death in a borrowed room, and he was buried in a borrowed tomb. All of these things function as part of a deliberate disguise, designed to be inconspicuous so that he would go virtually unnoticed, for the purpose of what? Was what Joseph was doing, misrepresenting himself, designed to figure out the motivations of his brothers? Does this parallel the Messiah Yeshua disguising himself so that he too could know what is in our hearts, our motivations, and our desire to seek the one the Lord God of Israel had sent? Yeshua lived most of his life in obscurity, similar to Joseph. We get a glimpse of Yeshua’s majesty during his Bar Mitzvah according to Luke 2:40-51 when he was recognized prophetically for who he was, the Messiah of God. For 30 years Yeshua did not work a miracle, just as Joseph did not enter into a place of influence and importance until he was 30 years old. We are left to wonder why the secrecy and mystery? This is part of the divine disguise, to demonstrate humility, and submission to the will of God according to His Torah and not according to our own way. Historically we see how positions of power and great wealth leads to arrogance and pride, those things which are contrary to God’s ways according to the Torah. This is why many miss who Yeshua was by not believing he is the Messiah of God because they expected him to come with political power and military might. In the rabbinic literature, one of the roles of the Messiah is to deliver the people from the oppression of the nations, and to lead the people in the way of God’s Torah. Biblically speaking, leading the people in the way of God’s Torah takes pre-eminence, as the Scriptures say, He came to “save His people from their sins” (Matthew 1:21). He came to empower us to overcome sin by causing the presence of God to dwell in our midst by the power of the Holy Spirit dwelling in our lives. If we consider the life of Yeshua, he lived a normal life, it was not extraordinary in the sense that he was perceived to be more than a man. When Yeshua stood in his hometown synagogue in Nazareth, when he revealed his true identity in Luke 4:16-30, his own townsmen said “Is this not the carpenter?” (Mark 6:3). The people accused him of blaspheme and attempted to thrown him off a cliff (John 8). In fact, in 6 A.D. Sephoris the capital of Galilee was destroyed by the Romans to crush a messianic-revolt four miles from Galilee. Considering these things, it is not surprising the people in Nazareth were skeptical of Yeshua’s claim to be the Messiah. We also learn that Joseph (Yeshua’s father) must have died since he is not mentioned following the opening passages of the gospels. Joseph’s trade was a carpenter, and Yeshua learned this trade to most likely help with supporting the family. This demonstrates for us the great importance of working and taking care of family. In those days, it is likely that they expected (had a presupposition of) the Messiah to pursue a more noble occupation than a carpenter. Because Yeshua did not lead the people in a military revolt, he was rejected by and large as the messiah as John wrote saying, “He was in the world, and the world was created through Him, yet the world did not know Him. He came to His own, and His own people did not receive Him.” (John 1:10-11). According to Rashi, the word וַיִּתְנַכֵּר להם is derived from נכרי, “stranger, alien.” Nachmanides explains that as soon as Joseph spotted his brothers and recognized them, he was afraid that they in turn might recognize him; this is why he disguised himself with a different type of turban, one which covered most of his forehead; or, he disguised his manner of speech including his stern demeanor, so that they would not be alerted to his true identity. In similar fashion we read in John 6:14 Therefore when the people saw the sign which He had performed, they said, ‘This is truly the Prophet who is to come into the world.’ 6:15 So Jesus, perceiving that they were intending to come and take Him by force to make Him king, withdrew again to the mountain by Himself alone. (NASB) here Yeshua hid himself. In Yeshua’s case he taught as a rabbi in the classical form. He did not approach the Scriptures in a way that was unfamiliar to his people and this was why they were so quick in desiring to make him a king. וירא יוסף את אחיו, Joseph saw his brothers, etc. When he saw them he felt as their brother and displayed friendliness towards them. It was only from the brothers’ side that he appeared as a stranger. The Torah emphasizes that he acted like this because the brothers did not recognize him. Joseph could speak to them sternly without the brothers taking offence as brothers. After all, he was a stranger to them. Joseph’s whole purpose was to devise a scheme whereby also Benjamin would come to Egypt. He also wanted to test them to see how they felt now about what had transpired between them many years ago. He then became aware that they were sorry for what they had done to him and considered themselves as having committed a sin against him. Joseph was critical of his brothers behavior and spoke to them harshly. He was able to talk to them harshly because he knew about their sins and he was one of them. This is also what we read in the Apostolic Writings about Yeshua according to Luke 5:30, Yeshua was a Pharisee, he was one of them, this was why they were able to criticize him and he was able to criticize them. In the narrative from Luke 5 we are told Yeshua goes to eat at the house of a tax collector. It says the Pharisees and their scribes were grumbling about the fact that he sat down to eat with sinners and tax collectors. Luke 5:30 states, those who complained were from the same sect. This indicates that Yeshua was from the sect of the Pharisee. This was why and how Yeshua was able to be so critical of the Pharisees and their actions because he was part of their sect. וירא יוסף…ויכירם, our sages explain that the fact that Joseph had left home when he did not have a beard yet, whereas his brothers already had beards accounts for the fact that whereas they did not recognize him, he recognized them. (quoted by Rashi) It is possible that they would have recognized him in spite of his having grown a beard if they had not seen the man confronting them dressed in the uniform of the highest ranking nobles of the land. They could not imagine that this man could be Joseph even if there had been points of resemblance. The idea that someone who had been sold into slavery had risen to such power was too mind-boggling for them. The idea here is that they did not understand how their brother could have risen to such a position of power having been sold into slavery. They presumed he was dead. The sages discuss the possibility of his beard causing his brothers to not recognize Joseph. This draws in the idea of physical appearances, the Scriptures say, the Lord said to Samuel, “Do not look on his appearance or on the height of his stature, because I have rejected him. For the Lord sees not as man sees” (1 Samuel 16:7). Here the Lord God explains to Samuel that outward appearances are not how we should make our choices. This application is found in Yeshua the Messiah and his appearance, what we see prophetically in Isaiah 53:2 “He had no beauty or majesty to attract us to Him, nothing in His appearance that we should desire Him.” This tells us that Yeshua, his appearance, was just like any other man’s meaning that he was ordinary-looking. Isaiah prophesies that the suffering servant rise up from lowly conditions and wear none of the usual emblems of royalty, making his true identity visible only to the discerning eye of faith. This is a pivotal significance as we understand God’s reign in our lives. The kingdom of God signifies God’s redemption power. His rule and reign encompasses the authority of Torah. The Apostolic Writings teach about the nature of God and are firmly rooted in the Hebrew Scriptures and parallel rabbinic thought. The Jewish background of early Christianity provides an enriched perception of the significance of these things, and the oneness of God in faith and practice. The point that we draw out from this week’s Torah portion is to be careful how we handle our presuppositions in what we are expecting from God. 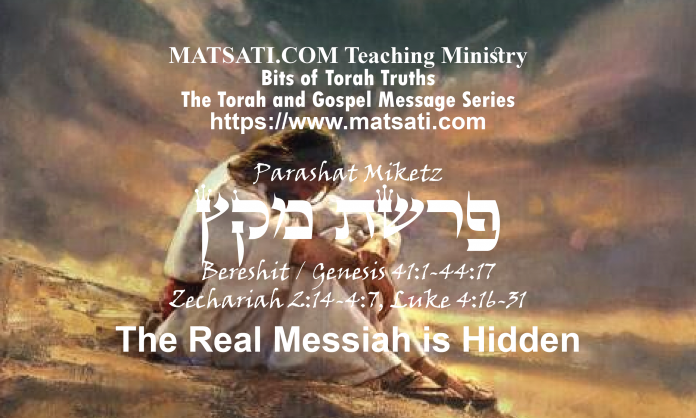 When studying the rabbinic literature, the role of the Messiah had two functions, (i) to lead the people of God in holiness, righteousness, and truth according to God’s Torah, and (ii) to deliver the people from foreign nations (oppressive people groups). The interesting point is the Lord God tends to focus more upon the Torah, having a relationship with His people, first and foremost as opposed to the deliverance from foreign nations. The reason this is so is if God’s people would obey God’s Word, there would be no need to be delivered from foreign nations because these things would not come upon His people if they remained obedient. This contains the idea of faithfulness, that faith is an active belief in the One True God, which results in a life of committed service and unyielding devotion to the Lord. True faith is accompanied by corresponding actions, just as Abraham had faith and obeyed God, this meant that his faith was active along with his works, and faith was completed by his works, and the scriptures were fulfilled having lived out the faith as it is written, “Abraham believed God, and it was reckoned to him as righteousness.” (James 2:22) We recognize these things being coupled to our faith in Yeshua the Messiah believing the Lord was beginning His work in us, His redemptive work, ushering us into his kingdom by faith in Yeshua His Messiah. This is why the Messiah was hidden in secrecy and mystery, to know our intentions, and the motivation behind seeking Him. This is part of the divine disguise, to demonstrate humility, and submission to the will of God according to His Torah and not according to our own way. Many miss who Yeshua was by not believing he is the Messiah of God because they expected him to come with political power and military might. Following his resurrection, we are told Yeshua has been given great power, authority, and majesty over all of creation, (see 2 Peter 1:12-21) which may be paralleled to Joseph’s position of power, authority, and majesty coupled with his ability to save from the famine (provide food). Yeshua, shrouded in mystery is able to save, deliver, and redeem us from our sins. The kind of kingdom that Yeshua offers us is a heavenly one that comes to dwell in our hearts. In the Scriptures, the Lord God Almighty tends to emphasize His Word (desire obedience rather than sacrifice) and so the emphasis of Yeshua was on obedience to God’s Word in love and righteousness. What history teaches us from the Torah, Neviim, and Ketuvim (Tanach) is if God’s people were to walk in His ways, there would be no need for deliverance from the nations, for the future expectation is that all the nations would draw nigh to us and to Jerusalem (Isaiah 2) God’s holy city. When Yeshua come to lay down his life for ours, he lived by example, and doing so to help us to understand what it means to live in service to God in bringing His kingdom to Earth in the hearts of men!